The SKINTOP® HYGIENIC NPT cable gland is now also available with NPT thread and certified to NSF/ANSI 169 for “food zone non contact”. 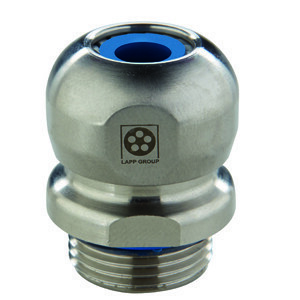 What makes the SKINTOP® HYGIENIC NPT special is the combination of hygienic design with an NPT connection thread. Most self-sealing pipe threads produced to the American NPT standard (NPT = National Pipe Thread) usually have a gap at the intermediate connection, while part of the outer thread remains visible. This feature clearly runs counter to the principles of hygienic design, which calls for surfaces to be as smooth as possible, without edges, corners and above all gaps in which food could settle and allow bacteria to develop. LAPP’s engineers came up with a smart design that creates an NPT thread with no gap and no visible thread. The cable gland therefore meets the latest directives of the European Hygienic Engineering and Design Group (EHEDG). It is also resistant to cleaning agents in line with the requirements of ECOLAB, a provider of products and services for industrial cleaning. The fact that the new SKINTOP® HYGIENIC NPT also meets the standards of the American National Sanitation Foundation (NSF) and is UL certified makes it an all-round product suitable for both export-focused plant engineering firms in Europe and those based abroad.